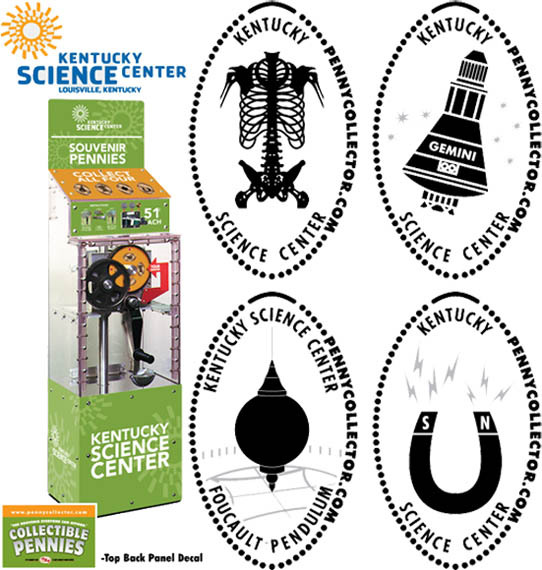 The Kentucky Science Center, previously known as the Louisville Museum of Natural History & Science and then Louisville Science Center, is Kentucky s largest hands-on science museum. It is lcated in Louisville, Kentucky s "Museum Row" in the West Main District of downtown. It was founded in 1871 as a natural history collection. More students in Kentucky take field trips to the Kentucky Science Center than to any other destination. A special hands-on area for children younger than seven was renovated and renamed KidZone in 1998, featuring six educational activity areas. The building takes up 150,000 sq ft. This includes a four-story Digital theater built in 1988 with a renovation in early 2014. The distinctive cast-iron facade limestone building was originally built in 1878 as a dry goods warehouse. The machine is open the First floor, Inside entrance door, to the left in front of the gift shop. 51 cents to press. Pennycollector machine.